Receptionist is a popular job all around the world. You will typically compete with other job seekers , and you will have to convince the HR managers that you are the best applicant for the job. The key lies in demonstrating the value you can bring to their team of receptionists. The right attitude you show in your interview, and good answers to their questions, will help you to convince them of this value. Let’s have a look at some questions they will ask you, and how you should answer each question. Why did you decide to apply for a job of a receptionist in our hotel (company)? What are your goals in five years from now? What characterize a good receptionist? Why should people choose our hotel, and not one of the competitors? Why should we hire you, and not one of the other people who apply for the same job? Honest compliment is your best bet in this case. You can tell them that you like the hotel chain (if it is a chain, or that you like their company, if you apply for an office receptionist job). You can also say that you like the atmosphere in the place. And if it is a bad place, but you still need a job there (a common situation indeed, and not a tragic one, becasue you can be the one who makes this place a better place to stay at), you can simply say that you like the location of the place (that it is close to your apartment), or that you believe to match the job description. Try to be specific with your answer. Check the company website and find something you can praise them for. They should have a feeling that you want to work specifically for them, that you did not apply for a job with them by a chance. Job of a receptionist does not offer many career growth options. You can become a lead receptionist (if you apply for a job in a big hotel), and you can perhaps join the team of managers, but honestly, it is not likely to happen. Therefore you should focus on other things than your promotion. You can say that you would simply like to become a better receptionist in five years from now, or you can focus on the goals you have in your personal life. Good receptionist should be nice and talkative, she should have some charisma, she should have a positive outlook of life and of other people. They should strive to provide a best possible customer service to each guest they meet in their job. Alternatively you can focus on the results of work in your answer, saying that you can tell a good receptionist by the number of guests who leave positive reviews on the hotel (company), or by the number of guests who return to the place again, just becasue they were satisfied with the staff members. Visit the website of the hotel, check the reviews on Booking.com, and on other popular websites (Trip Advisor, Expedia, Trivago, etc). Or, even better (but only if you can afford it, and if you do not interview for a job in ten different hotels), spend a night at the place before you interview for a job with them. This experience will help you to understand why people choose them, or why they should choose them (good location, wonderful people, clean rooms, great variety on breakfast, wellness included, you name it :)). * Special Tip: Looking for brilliant word-to-word answers to all questions you will get in your interview? Check the Receptionist Interview Guide from Amanda Seizling. No more interview stress. No more problems. Just you, great interview answers, and a new job contract. Mention all languages, even if you are just starting to learn one of them. To know how to greet the visitor, how to book the room for them in their language, or how to give them basic instructions about the place and the surrounding area, would suffice for most receptionist jobs. You can also say that you are learning a new language (or even just planning to learn one). Try to show the hiring managers that you always strive to become a better receptionist, that you do your best for the guests. This is a difficult question for everyone. You can either try to find something that distinguishes you from the rest of the pack (it can be your excellent social skills, your vast experience with similar jobs, some personal traits that make you unique as an employee, your special attitude to job and other people, etc), or you can simply name some skills that make you a good receptionist (check the third question on this page). Check the average salary for receptionist in your city/country. Just google it, there are statistics for each country, and for each job. Salary.com and Indeed.com are some of the websites that offer the numbers. If you apply for a position of a hotel receptionist, however, there typically won’t be much room for salary negotiation in your interview. Most big hotels pay the same salary for every new hire, every new receptionist. The employee fluctuation is quite high in this industry, and they will raise your salary once you stay with them for a couple of months at least. In this case you can say that salary is not the deciding factor for you, and that you will accept the same salary they offer to every new hire. On the other hand, to be over-friendly to guests, passionate about the job, or perhaps over-punctual, are good answers, since many employers would not consider them your weaknesses at all. But if you want to talk about real weaknesses, you can go with something like bad management skills, or computer skills. You will not manage anyone in your job (except of yourself), so the level of your management skills isn’t really important for the interviewers. And while you will work with computer software, this software is not difficult to handle, and you will get a training before you start the job. Therefor your average (or even below-average) computer skills do not matter much for the interviewers either (or at least they should not matter for them). On the top of that, you can say that you try to improve on your weaknesses (attending evening computer classes, getting feedback on your work and trying to rid of your weaknesses, etc), to show them your great attitude to yourself, and your personal development. It is good to ask one or two questions at the end of your interview–if you get a chance to ask them. You can inquire about the next step of recruitment process (second interview, final interview, etc), or about the job itself (the structure of the working shifts, working patterns at the place, where the receptionists sleep, if they can stay in the hotel when not on the shift, etc). Amanda Seizling, a recruitment consultant who works with several hotel chains in the United States runs a website that specializes only in receptionist interview. 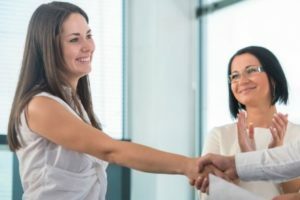 She wrote a great eBook with answers to twenty five most common interview questions for this position, and with an in–detail guide on how to ace a role play in your interview. You can check the samples from the eBook on the following address: Receptionist Interview guide. Highly recommended for hotel receptionist job applicants! How to dress for your interview – Four rules to consider when choosing clothes to wear. Every word you say matters, every detail counts. Learn how to choose the right dress for your interview. Advice from InterviewPenguin.com – Your best job interview coach since 2011. How to answer interview questions – It is not only about what you say, but also how you say it in an interview. 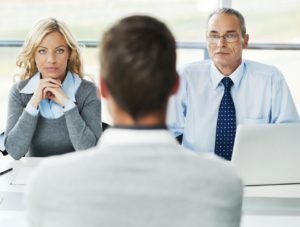 An interesting insight on the art of acing the job interview.